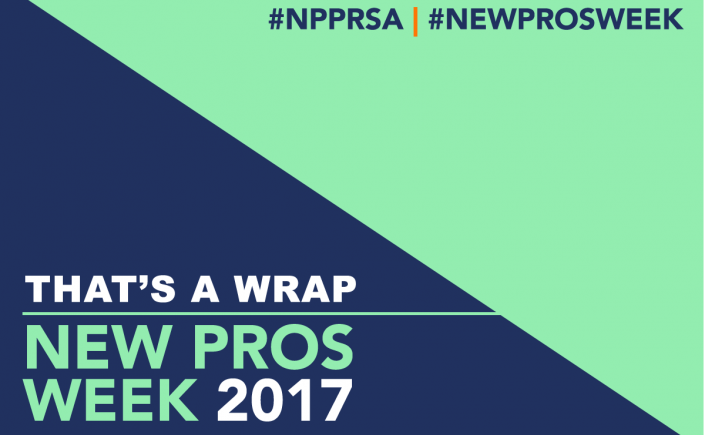 Thank you for joining us for New Pros Week 2017! 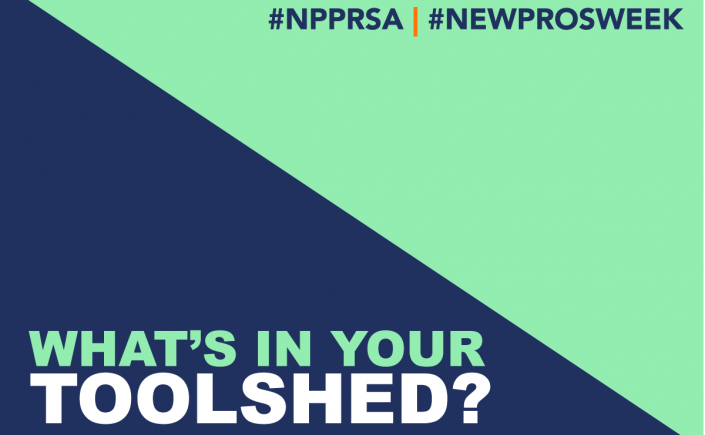 Each year, PRSA’s New Professionals Section puts together a weeklong celebration of PR’s new, aspiring and up-and-coming professionals. Working together with PRSSA and PRSA, we organize conversations and programming that highlight the great things new pros bring to the profession. This year, we decided to take it a step further and focus not only on our successes and newness, but to explore the opportunities out there for us to grow and learn as we progress through our careers. We worked to build conversations around what we need to know and what we can to to set ourselves up for career-long growth, how we can find and utilize a mentor relationship to grow as PR professionals, what we can do to give back and cultivate future PR talent, and the importance of building and maintaining our networks. In addition to conversations, we created handouts and guides to help members find their own path to success. If you missed any of last week’s New Pros Week events, don’t worry – we’ve got you covered! Miss our Twitter chat “Planting seeds for career-long growth?” Catch the recap here. Couldn’t make our webinar “Fill Your Garden: Mentorship and making lasting connections” with Kelly Davis, APR, and Lori Marble, APR, Fellow PRSA? The replay will be going out soon via email, but check out these resources and the presentation from the webinar here. Want to build your network? Follow fellow New Pros and some of our favorite resources and inspiring accounts mentioned during #FollowFriday. Bonus – this month’s PRSA’s Public Relations Tactics featured a few great articles for New Pros, including one by our own programming chair, Robyn Rudish-Laning. Read the digital edition here or check your mailbox for your print copy. Celebrating New Pros doesn’t have to be limited to just one week of the year! 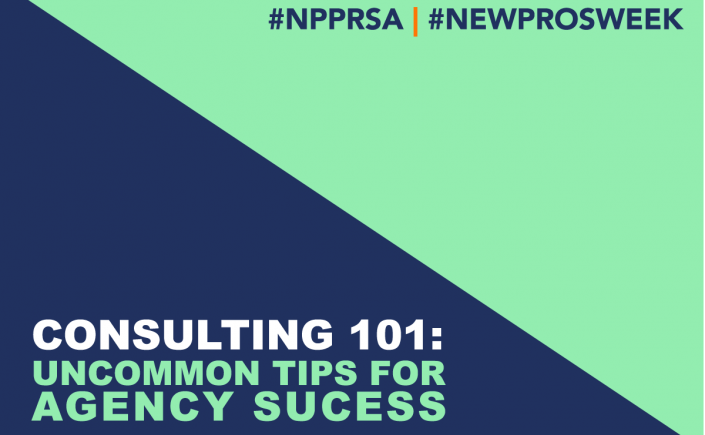 If your organization or PRSA chapter is interested in engaging New Pros and creating programming for them, here are a few of our tips. When we began planning New Pros Week, we began discussing what kind of theme would best tie everything together and give members concrete advice and next steps once the week was over. As we mulled topics over for different programs, there were a few things we kept coming back to: what do New Pros need to be successful and what do we wish we had known before we entered the working world. The answers to both of these questions are key to professional growth, the theme we decided on for New Pros Week 2017. To gather the best advice we could, we asked New Pros from all over to share their insight with us and the wider New Pros network. Below is advice from fellow New Pros. What tools & skills do New Pros need in their toolshed? What do you wish you had known before that may have helped you grow where you were planted in your first job? What’s the best advice you have for other New Pros? What skills do you think are essential? Comment below or tweet at us! Public relations agencies are microcosms of the greater industry, embodying the most dynamic and challenging elements of communications work. Achieving success in the agency setting requires hard work, long hours and a laser focus on personal growth. After one year into my role at a global public affairs firm, I looked back to take stock on what I believe makes a communications consultant stand out. Understand the business of the business. 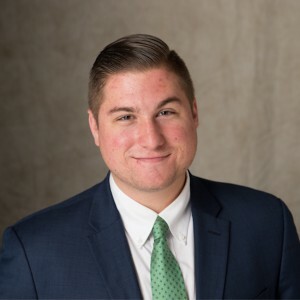 For a junior staffer, a comfortable understanding of budgeting, billing, staffing and client services can be a significant differentiator. Public relations agencies are professional services businesses, and employee billings are the primary driver of a company’s revenue. Whereas it’s certainly not all about the money, a budget-conscious approach to work is a paramount trait among strong leaders. The best way to position yourself for advancement is to look to those working above and alongside you to gain an understanding of the fundamental questions behind the business: How does my company make money? Am I doing everything I can to maintain top-quality and budget-conscious service? How can I help to keep my clients happy? Master flexibility. Communications work is often unpredictable. Depending on your occupation, the degree of this unpredictability can vary dramatically. However, a basic principle of agency work is to expect the unexpected. As an agency professional, you will need to be able to work quickly and tactfully with a variety of issues. The best practitioners can approach an issue, dig into it with confidence and handle it competently. Learn to embrace the project-based and short-term engagements that tend to appear in the agency setting – every task is an opportunity to demonstrate your aptitude. If you’re unfamiliar with a topic or task, embrace it, and ask every smart question you’ll need to inform your success. Never say “that’s not my job” or appear reluctant to roll up your sleeves and engage. Learn how to quantify your own successes. When you work in an agency, it’s easy to become consumed with the day-to-day rigors of short turnaround deliverables, meeting your managers’ expectations and articulating your work’s value to clients. Measurement is the key component of demonstrating the value of public relations, for both campaign outcomes and your individual services. Young professionals should maintain a file of professional accomplishments that quantify your hard work. This can include a list of valuable media hits, event results, campaign outcomes or any other computable metrics, including something as simple as a “good work” email from the client. When the time comes to discuss your performance, you’ll have a portfolio of your own achievements to lean on. Don’t fear strategy. It’s easy for junior agency staff to feel like they’re running through the motions, often executing on the tactics assigned by mid-level account leaders and senior agency directors. Young professionals joining the agency world should be mindful of this dynamic, but never abandon the instinct to think and counsel strategically. You don’t need to have 20 years of experience to have a good idea, and you must embrace the reality that you are a part of the team. Be careful and measured in your proposal of good ideas, and be open to healthy scrutiny. Don’t be afraid to speak up, and always remember it is your remit to take the active role in bringing your ideas to life. The best young professionals are always looking to take their roles to the next level, constantly asking, “what can I do to add value here?” What do you do to add value to your agency? Gary Bridgens is a project consultant in APCO Worldwide’s New York Office, and the PRSA-NY Executive Secretary. Connect with him on LinkedIn, or email him directly. For more information, and ways to get involved, with this year’s New Pros Week check out the below infographic schedule, or click HERE. 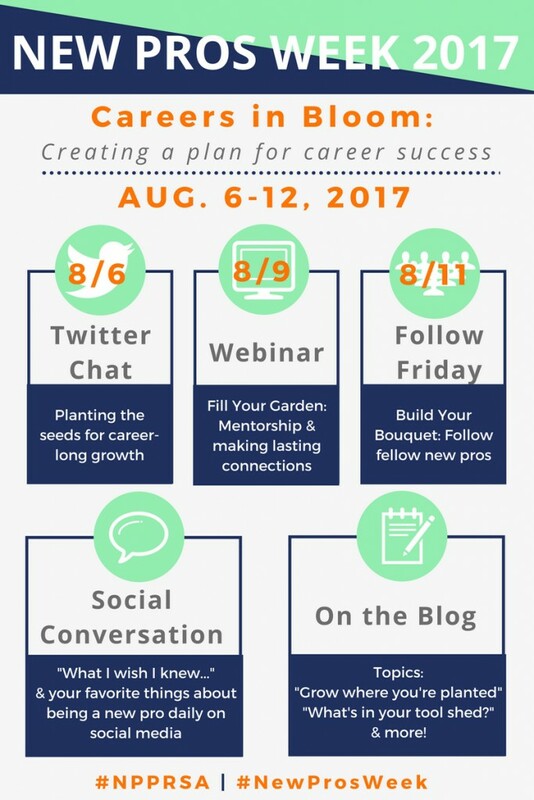 We’d like to thank everyone who participated in the 2017 New PRSA New Pros Week Twitter Chat as we discussed what it means to be a new professional and what steps we can all take to maximize success. Review highlights of the chat below. What did you learn from the August chat? How can you maximize YOUR success as a PR New Pro? The first time I joined a formal mentoring program, I seriously lucked out. I was matched with a passionate, candid, talented vice president who answered all my questions, let me shadow her and her team, and provided invaluable advice. She helped me consider my career options, negotiate, and advocate for myself at the crucial point in my career when I was transitioning from grad school and freelance life into a full time job. I knew even then, my situation was not typical. Finding a great mentor isn’t often so straightforward and effortless. Sometimes, formal arrangements fall short of expectations on both sides of the relationship. Or more often, a formal program isn’t available and you have to get creative in finding a mentor. Recently, it occurred to me I have another mentor close at hand — just a few desks away, actually. Turning to my coworker when I need help solving a problem, learning from her years of experience at our company and other organizations, I find there are elements of our working relationship that look a lot like mentoring. It’s valuable because we share a work environment, and have similar goals and expectations about our careers. She’s inspired new ideas for my career growth and expressed support along the way. One mentor was a conscious introduction, while the other grew organically, but both relationships have established a sense of trust and over time become valuable to me in their own, unique ways. And like all relationships, both have required effort and reciprocity on my part to maintain them as lasting connections. There’s no universal formula, but there are certainly new ways of thinking about mentorship that can serve New Pros as they work to forge connections. 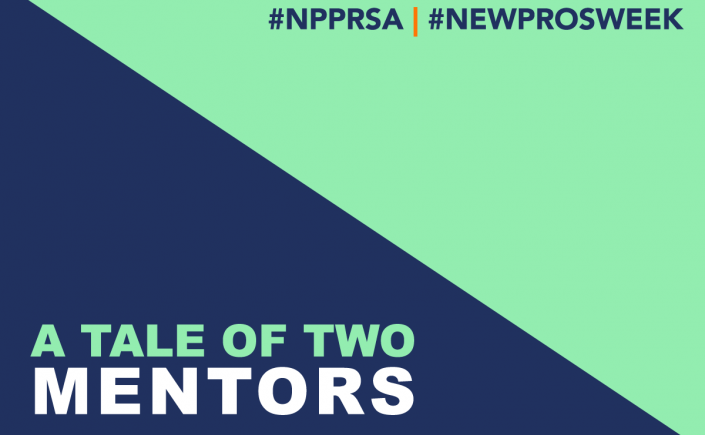 Join us during New Pros Week for a special webinar, where you’ll get advice on how to find a mentor, be a great mentee, and fill your life with valuable connections. 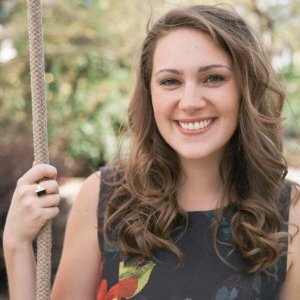 Alyssa Thys is a member of PRSA Georgia and a communications specialist at Piedmont Healthcare in Atlanta. She serves on the New Professionals executive committee as the mentoring chair. Alyssa is a graduate of Agnes Scott College and the University of Georgia. Find her on LinkedIn or Twitter.